← Boston Flower Show Preview Party – Come Join Me! Jack Frost may have missed New England this winter but his leafy namesake has earned top billing as the 2012 Perennial Plant of the Year! I’m definitely putting this plant into my garden because it pretty, hardy and performs best in shady areas. Need plants with all three traits to thrive in the big, bad city! 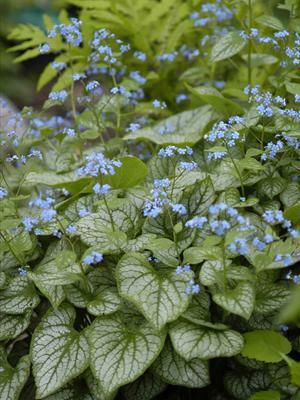 The Perennial Plant Association says Jack Frost (Brunnera macrophylla) sprouts clusters of blue forget-me-not blossoms from mid to late spring above silvery, heart-shaped leaves. Sounds lovely and looks great! along the front of a shade border. The silver coloring lights up a darker garden from spring to fall. in a shade container. It grows 12 -15 inches tall and will spread to about 20 inches wide. with other ground cover perennials. 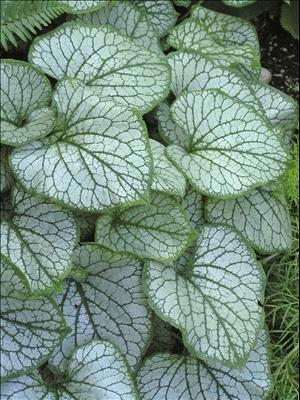 Try with hostas, ferns, epimediums, hellebores and heucheras. These like shady, moist conditions too. Yahoo! Spring is on its way! This entry was posted in Flowers and Plants, Recommendations and tagged 2012 Perennial Plant of the Year, Heartshaped Leaves, Jack Frost, Shade Loving. Bookmark the permalink.